I was asked to give one of the opening overview talks at the Internet Identity Workshop about how the “Open Stack” is getting mainstream sites interested in supporting OpenID, OAuth, and Portable Contacts, because the combined value these technologies offer together is greater than the sum of their parts. Having learned so much myself at previous IIWs, it was both an honor and a unique challenge to address this crowd and do them justice–the audience is a mix of super-savvy veterans and new people just getting interested in the space, and I wanted to please everybody. So I put together a new talk with a new core message: the Open Stack is greater than the sum of its parts, and together these building blocks are delivering enough value to make the proposition a win-win-win for developers, users, and site owners to adopt and embrace. The talk was well received, and it led to a lively discussion afterwards in the break and at dinner. I can’t wait to see what sessions people will call over the next two days to discuss these issues in more depth. It was certainly a joy to be able to demo running code on Yahoo, Google, and MySpace as part of my talk–this is no longer a theoretical exercise when it comes to talking about putting these standards to work! I was even able to show off a newly developed Android app that uses OAuth and Portable Contacts to allow import into your cell phone from an arbitrary address book. 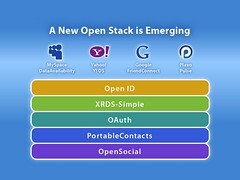 I just found about the app this morning–now that’s the Open Stack in action! As usual, John McCrea covered the event and provides a great write-up with pictures. 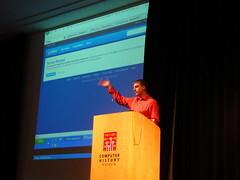 Update: MySpace’s Max Engel captured a good portion of my talk on video. Joseph, Are you planning on uploading your talks to slideshare? Would be really helpful! Thanks sharing your energy and passion with us and then uploading your deck to slideshare. To address the light slides/communicating less issue, perhaps have someone video your next talk to upload to youtube/vimeo/similar service? Hi Joseph, I just got inspired! why we don't have “openApplicationID” , a developer signup for single ApplicationID from a provider, and then he/she can use many web 2.0 services from different vendors. For example a developer come to plaxo(an openApplicationID provider) to use its API and end up using plaxo API(which gives some kind of unique added value) layered on top of “many other Web2.0 APIs” that all integrate seamlessly together because of that “openApplicationID” and by seamlessly I imagine if the application chooses DISQUS for making comments then Blogger, youTube, and Flikr comments functionality will be overridden by the openApplicationID provider to give the application a way for using DISQUS for all of them and then port comments back to blogger, youtube and flikr; and so on! is this a good idea that might scale? Maybe google app engine team will do it “their way” at some point! !